Release Dates: 01.02.2012 (UK), 03.02.2012 (USA). 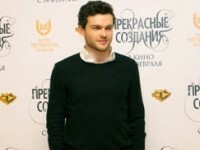 Russian Distributor: 20th Century Fox CIS (02.02.2012). Genres: Drama / Horror / Sci-Fi / Thriller. Starring: Dane DeHaan, Alex Russell, Michael Kelly, Ashley Hinshaw. 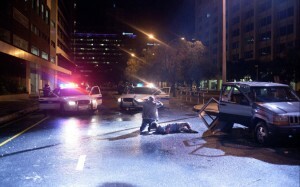 On February 3, 2012 a new American Sci-Fi thriller opens in the U.S. The release date for the UK though is set two days earlier. The film’s title is Chronicle, review of it below will tell you more about another attempt to make a big movie with a small camera. The global film industry has grown to an enormous extent. At the moment, you can find movies for every taste. Each their author tries to show all the strength to stand out from the rest, while some others are just looking for an opportunity to show their creative vision to the public. In an era of sharing videos over the web the American producers turned their attention to a still rare technique of filming with amateur and semi-pro cameras. This approach was used, when launching a new Sci-Fi franchise. Some time ago, the idea of ​​replacing the operator with an actor holding a hand-held camera looked incredibly appealing, blending style of a documentary featurette with a more traditional film’s entertaining narrative. 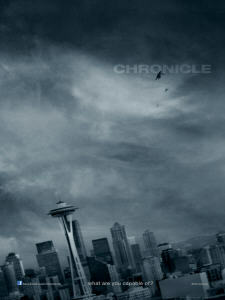 The new motion picture, which walks this way, is called Chronicle (2012). Certainly, it looks being greatly inspired by some similar works from the past like the wide-known movie The Blair Witch Project (1999) or the one with a huge monster attacking a big city, as it happened in Cloverfield (2008). While some filmmakers look for increasing the size of the screen, improving image’s sharpness and clarity, others search for new ways of monetizing 3D and all its pseudo-counterparts like 4D, 5D and others, entertaining merely trade mall daily visitors. For example, the first option is clearly picked by the creators of a recent Spy Action film entitled Mission: Impossible – Ghost Protocol (2011), releasing their product widely for IMAX. Meanwhile, each approach has its own strengths and weaknesses. Though today we are talking about the third and a completely different way from the two mentioned above. Quite an interesting question that arises from this, whether or not such movies are partially sponsored by the makers of amateur and semi-pro video cameras. For example, when you start watching Chronicle, you get to see a lot of these making you feel like visiting a handycams exhibition. Here these cameras are shown from all possible sides. One event in the script even makes a guy lose his camera to be able to buy a new one. To a strange coinсidence, it holds improved focus abilities and performs better generally. Right from the start here you will embark on an adventure similar to those featuring missed video tapes, which are then found by someone holding an important part of stranger’s life. The lens are sharply turned in all directions, the filming is made from the most unusual angles, and, of course, the lack of a focus stabilization makes you remind of the last time you rode a Roller Coaster right after eating lunch. Yes, it can be rather tedious at times for the eyes, but there is a niche audience that enjoys such a look. The folks at the 20th Century Fox corporation are real special effects masters, and Avatar (2009) directed by James Cameron was just one more example proving this. It seems, that for the company the ideas brought with the Chronicle film look as a kind of experience in a new field. You can even consider it as a response to the Cloverfield movie project from Paramount Pictures, though our today’s Review subject is not so massive and comes much more shifted towards a younger teenage crowd. Of course, you shouldn’t think of this film being made only with unprofessional cameras. The creative process here is much more complex than it can look from the first sight. It certainly involves proper editing and making cuts, employing a set of professional operators with expensive equipment and making all the actors truly realize, what they are taking part in understanding the needs of the genre. The main goal is to capture every second of someone’s life telling a whole story and showing everything without censorship, but only relevant to the plot. The same applies to Chronicle, and this thriller is partially filled with some Dramatic notes. By the way, the production of this film was undertaken by Davis Entertainment. The US-based company has been serving the needs of the producers for more than a dozen years. If you still remember the titles like Crocodile Dundee trilogy (1986-2001), then it might ring a bell. The Director of the new movie is Josh Trank. He can be considered a novice in such a position at the professional film industry, though he already tried his hands with some TV works and got more experience with other career responsibilities. This film is his big screen debut. The idea for this movie visited Josh, when he was aboard a plane watching the skies and imagining people playing football in-between the clouds. A story to support this vision was quickly created by Max Landis, which is more known for his father – director John Landis. One of his latest projects is a comedy titled Burke and Hare (2010). Indeed, not all the heroes super, as the slogan of the Chronicle film reveals. 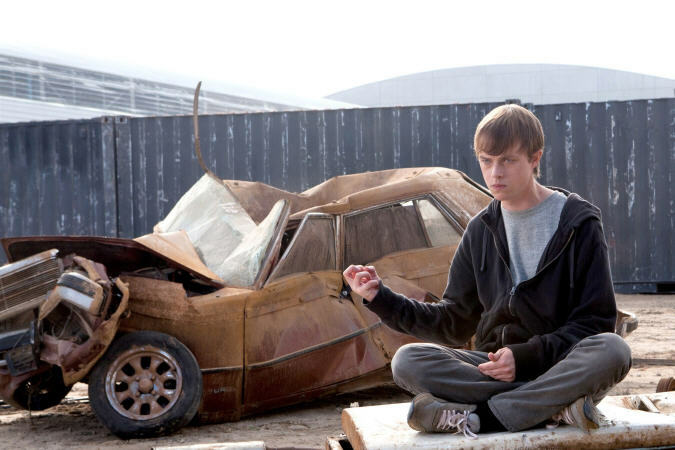 The central character of the plot is a troublesome teenager Andrew Detmer, which is played by Dane DeHaan. Earlier this actor was beginning his career at the Broadway Theatre, so this move is, certainly, a progression forward for him. While his Andrew isn’t very popular among his classmates at school, he is being constantly bullied by a gang of neighboring thugs always hanging out close to his house. He suffers not only in the streets, but at home as well, watching a mother slowly dying from a painful disease. Actress Bo Petersen handled this suffering person, yet still loving her son a lot. Andrew’s father is a rather violent male. His name is Richard Detmer, and during free time he enjoys beating the kid and criticizing him for everything. Michael Kelly, who was cast for this role, is one of a few well-known stars of this team. Richard Detmer could be a nightmare for any employment service worker. The former firefighter injured at work, now he lives compensating his bills with the insurance income. At the same time, his son in the Chronicle film is doing much better being able to save 500$ to buy himself an Advanced Camcorder. It looks as a much more expensive model though. For the curiosity sake, we browsed the Web to find out that 1500$ is the lowest price for video cameras shown as amateurish in the movie. We guess, the film’s consultant should get a cookie taken back for some unrealistic plot parts like this one. Well, when Andrew got his camera, he decided to start filming everything around him starting from his only friend singing in a car, who is also his cousin named Matt Garetty and performed by Alex Russell. After providing a comprehensive overview of all Andrew’s social failures the narrative of this drama suddenly turns to another road. At a teenage party, Matt and his friend, the Presidential candidate of the school board, Steve Montgomery, finds a mysterious hole leading underground. Steve played by Michael B. Jordan takes his mates below to discover a glowing crystal, probably, belonging to some extraterrestrial origin, though it is never cleared out completely in the Chronicle movie for the sequel’s sake, we suppose. Just one touch of this object’s surface makes all the trio get some incredible Telekinetic abilities. No less the viewers of the Chronicle thriller would be suprised, how easily the film changes its pace moving from Drama to Comedy, showing the characters having fun with the shoppers at a local supermarket, while relocating the objects they hold with simple thoughts. A moment comes, when they begin to understand all the power of their new skills. These allow to throw anything or anyone anywhere and even squeeze targets to make them fall to pieces, what can happen to humans as well ending them dead. The friendship inside the trio gets damaged after the initial period of euphoria, which in parts resemble the events happening in the poor plot of The Covenant (2006). Andrew has suffered from lack of attention for too long to waste his chance to conquer the world with his power. Hardly he would like to miss such a chance. A random victim of the following events might be hurt as well. She is Casey Letter played by an American actress and model – Ashley Hinshaw. Here she presents a girl, who Matt is really attracted to, what adds motives for increasing the tension. The confronation in the Chronicle film is based on the classical wisdom that unlimited power is hard to control, yet can be very dangerous to all others becoming pawns in a game with the owners of such rare Telekinetic skills. At some point the characters learn the ability to fly in the sky doing it better than planes can and making Josh Trank’s dream coming true on screen. They are even able to grant the same skill to the Andrew’s video camera, while freeing their hands. This makes the image crispier and more stable to let the action portray everything without the need for them to hold it tight anymore. With such a small budget of 15 mln. USD the team has decided to make one good action sequence filled with special effects instead of many poor ones. 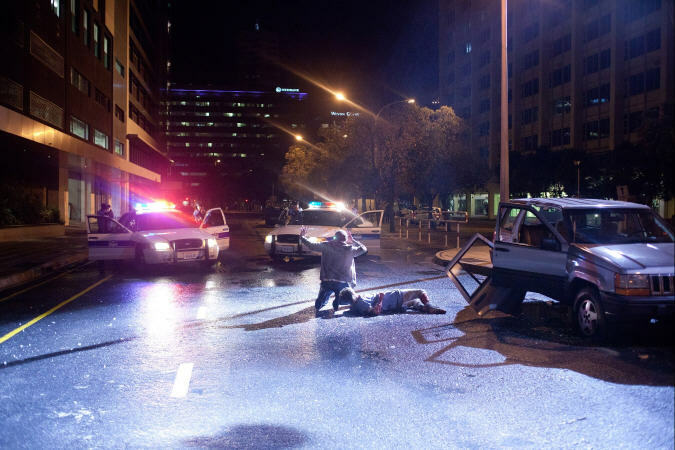 The spectacular episode is accompanied by explosions, flying objects, unusual air movements and SWAT officers trying to apprehend at least someone to stop the havoc. The abundance of digital techonologies and computer graphics used is clearly visible, though it is still a satisfying change of pace moving away from the slow teen drama prevailing in the first running time hour. The soundtrack for the Chronicle film we are discussing in this Review hasn’t been composed by any sound star exclusively. Perhaps, to save time or to cut production costs a decision was made to hire a Music Supervisor instead. Luckily for the film, the task went to Andrea von Foerster. She has got vast experience for such challenges ranging from the same type of work on TV at the set of The O.C. (2003-2007) to making a compilation of tunes for the upcoming family adventure film - Journey 2: The Mysterious Island (2012). Dane DeHaan has also become one of the additional film operators in the crew, thanks to the script. He was regularly offering new ideas to all his colleagues on working with a hand-held camera. That is quite an interesting move, when the actors themselves are actively involved in the Production process. In this context, we do also remember the Coriolanus (2011) idea coming from the actor and director – Ralph Fiennes. We have got controversial emotions after watching the Chronicle film. On the one hand, it is nice that the producers do not forget about the hand-held filming technology. Though not as big of a novelty anymore, still you can see some spectacular special effects in a few scenes of the movie. However, the filmmakers haven’t tried enough to determine their story’s goal, whether they were making a teen comedy, a school years drama or a Sci-Fi action flick. It is too hard to be a good player in all these fields at the same time. 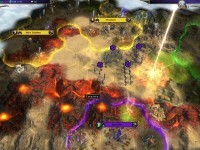 Also we don’t see many unique features, which could fairly compete with other notable titles in the same category. However, the ending gives a clue of a new franchise that might be born out of this, if the box office figures get favorable for the producers.